Anne Clinard Barnhill's "Queen Elizabeth's Daughter"
Anne Clinard Barnhill has been writing or dreaming of writing for most of her life. For the past twenty years, she has published articles, book and theater reviews, poetry, and short stories. Her first book, At Home in the Land of Oz, recalls what it was like growing up with an autistic sister. Her work has won various awards and grants. Barnhill holds an M.F.A. in Creative Writing from the University of North Carolina at Wilmington. In Queen Elizabeth's Daughter, there is no question about who should play Elizabeth Tudor. Cate Blanchett has already proven she understands the complexity of the queen in two movies, Elizabeth and Elizabeth, The Golden Age. She has the skill to expose the many layers that make up the woman for whom an age is named, and could easily handle the tender and sometimes brutal scenes required. As her royal ward and ‘daughter,’ Mary Shelton, Emma Watson, of Hermione fame can skillfully portray a spirited, intelligent young woman who must eventually make a decision that will change her life, perhaps even end her life. As Mary’s love interest, Sir John Scudamore, the handsome Henry Cavill would do nicely. For history lovers, he will be remembered as Charles Branson from the series, The Tudors. For others, he will be recalled as the most recent incarnation of Superman. He can convey the passion and romance called for in Queen Elizabeth's Daughter. And, for Robert Dudley, the patient wooer for Elizabeth and her one true love, Clive Owen, who has played against Blanchett previously in Elizabeth, The Golden Age as Sir Walter Raleigh, made sparks fly then. I believe those two could light up the screen now. All would be directed by John Madden, who has proven his knowledge and understanding of Elizabethan London in the great film, Shakespeare in Love. Visit Anne Clinard Barnhill's website. The Page 69 Test: Queen Elizabeth's Daughter. A lot of actors have played Mark Twain over the years. Hal Holbrook might be the best known, but Val Kilmer has also suited up for the role. There’s also that time-traveling episode of Star Trek: The Next Generation when Twain helps rescue Captain Picard. These Twains are invariably the Twain of popular imagination: the man in the white suit, with the electric shock of white hair, chomping on a cigar, dispensing witty one-liners. This was Twain in his later years, when he was a national icon and an international celebrity, and his best work was behind him. My book focuses on the younger Twain, when he was just embarking on his literary career, and he hadn’t yet learned how to conceal his tumultuous inner life under a genial grandfatherly façade. Twain in his twenties and early thirties was tormented by depression, mania, professional uncertainty, financial fears. He was an extremist, prone to excesses of all kinds and terrifying flights of rage. I’d give the part to Matthew McConaughey, who’s proven his high-Method chops with True Detective and Dallas Buyers Club, and could bring an appropriate degree of demonic intensity to the role. I also think he could nail Twain’s voice, which was infused with a peculiar droning, drawling, drunken twang. My book’s other characters might be a bit harder to cast. Bret Harte was dandyish, aloof, and sarcastic. He emerged from San Francisco’s literary scene of the 1860s to become America’s most famous writer for a brief period before completely self-destructing, and spent the rest of his life in relative obscurity and poverty. I could see Robert Downey, Jr having fun with it. Charles Warren Stoddard had great spiritual depth and little practical sense. He always had an air of boyishness about him—a permanent child, even into middle age. Michael Cera? Elijah Wood? Ina Coolbrith might require the most nuanced performance. She was a very specific mix: stubborn, solicitous, self-pitying, irreverent. I’d nominate Tilda Swinton, who’s one of my all-time favorites. I hope the movie studios are listening. The Page 99 Test: The Bohemians. Jill Kelly's "Fog of Dead Souls"
Jill Kelly is a writer, visual artist, creativity coach, and freelance editor. A long-time college professor of literature, she has been writing and publishing since 2002. Her memoir, Sober Truths: The Making of an Honest Woman, was a finalist for the prestigious Oregon Book Award. About halfway through the writing of Fog, I knew I had a great movie as well as a great read in the making. Why? Because I was writing about three substantial characters in their 60s—a female college professor, a male detective, and a cowboy—and there are a number of terrific older actors who are making great movies and original series for TV. Ellie McKay is a professor of French whose surgeon boyfriend is murdered in their hotel room on a weekend trip to Gettysburg. Already struggling with alcoholism, Ellie gets tipped over the edge by the violence she experiences. The incomparable Meryl Streep has the versatility to play this role. She could brilliantly do the wounded and the brazen sides of Ellie that we come to see. However, I’d be more inclined to beg Debra Winger to come out of retirement and play this role. She does savvy yet naïve with such dazzling nuance that I’d love to see her be Ellie on the screen. Al Robison is the rancher with a dark past who proposes to Ellie 30 minutes after he meets her in the Maverick Bar in Farmington, New Mexico. Sam Shepard is one of my favorite cowboy actors but he doesn’t have the body type I need for Al. Then again, not many actors are 6’4” with thick white hair. Robert Redford of 10 years ago would be great. In fact, he might still be great. We could also cast Morgan Freeman in this role. He definitely has something Al-like about him. And there’s always Clint Eastwood. Doug Hansen, the detective in love with Ellie, is patterned after the husband of a good friend of mine. Sadly, the real Doug Hansen is a painter, not an actor, so I don’t think he’d bring a lot of clout to the box office. So I’d go with Kevin Spacey. He can do the sad, worn-down-by-life aspect of the detective with ease and he also has the intensity to pull off Hansen’s passion for solving the crimes. I very much like the idea of Kevin and Debra together. Of course, you’ll have to read the book to see if they end up together. There are some great minor roles in this book as well: the knowledgeable Detective Capriano with his penchant for good food, the slimy Arlen Gerstead, the surgeon boyfriend, Al’s angry ex-girlfriend, the female shaman, and of course the killer himself. I’m hoping Hollywood will be knocking on my door at any moment. I’m also hoping that you’ll read my book and let me know what you think. The Page 69 Test: Fog of Dead Souls. Daniel Sutherland's "Whistler: A Life for Art's Sake"
Actually, it is not pure speculation on my part to consider the lead roles in a movie biography of James Whistler. I was a consultant for the script and will appear as one of several “talking heads” in a film documentary about the artist, James McNeill Whistler and the Case for Beauty, to be broadcast on PBS this fall (probably September). Our producer was lucky enough to snag Angelica Huston as narrator and Kevin Kline as the voice of Whistler. (Vanessa Redgrave was to have supplied the voice of Anna Whistler, his mother, but had to bow out for contractual reasons). As for Kline, he will not appear on screen, and is now a bit long in the tooth to play the young Whistler, but I think he would still be perfect as an aging Whistler (he is now 66 years old, Whistler died at age 69). As for others in my cast, the next most important roles would be the women in Whistler’s life, most importantly his mother Anna, but also two of his mistress-models and his wife. His small, delicate mother would have to be played by someone like Sally Fields, who did an admirable job as Mary Todd Lincoln in Lincoln. Whistler’s first important model, a redheaded Irish girl named Joanna Hiffernan, could be portrayed wonderfully by Nicole Kidman, a redheaded Australian, but she may be too far on the wrong side of twenty. Keira Knightley is probably a better bet. His next most important model, Maud Franklin, was not as conventionally lovely as Jo, and might be captured very nicely by Hilary Swank. Finally Julianne Moore would be perfect for Whistler’s eventual wife, whom he did not marry until in his mid-fifties. Lights! Camera! Action! 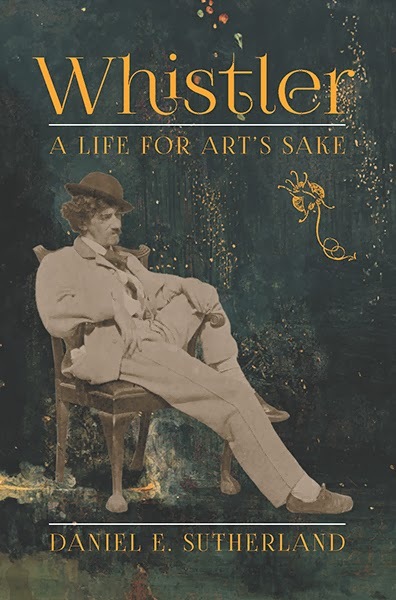 Visit Daniel Sutherland's faculty webpage, and learn more about Whistler: A Life for Art's Sake at the Yale University Press website. The Page 99 Test: Whistler: A Life for Art's Sake. Jane Nickerson's "The Mirk and Midnight Hour"
For many years Jane Nickerson and her family lived in a big old house in Aberdeen, Mississippi, where she was also the children’s librarian. She has always loved the South, “the olden days,” gothic tales, houses, kids, writing, and interesting villains. After five great years living in Ontario, Canada, Nickerson and her husband have returned to Aberdeen where they live in a lovely little old house that is a television star. You know, I do believe The Mirk and Midnight Hour would make a riveting costume drama—lush Southern scenery, heartwarming bits, chilling bits, moral questions to ponder, and an opportunity for lovely clothes and an all-star cast. Learn more about the book and author at Jane Nickerson's website. The Page 69 Test: The Mirk and Midnight Hour. Aaron Thier's "The Ghost Apple"
Aaron Thier's writing has appeared in The Nation, The New Republic, and The Buenos Aires Review. He is a graduate of Yale University and of the MFA program at the University of Florida. When people ask me what The Ghost Apple is about, my instinct is to keep silent, but this is pointless and self-defeating and it really isn’t so hard to say. It’s about a small college that sells itself to a snack food company called Big Anna. This company overthrows the college president, drugs the professors, and enslaves a group of study-abroad students on its plantations in the Caribbean. The principal characters are Bill Brees, the elderly dean of students, who goes undercover as an incoming freshman to learn what student life is really like; Maggie Bell, a student who travels to the Caribbean; John Kabaka, a history professor turned revolutionary; and William Beckford, a depraved English professor who speaks in quotations from Mussolini and becomes the college’s Big Anna-appointed dictator. The Ghost Apple: A Hollywood Movie is a thing almost impossible to imagine, but why should that matter? The easy choice for the kind bemused loveable dean is Bill Murray, who plays every kind bemused loveable old man, and we all love him, and why shouldn’t we? But an edgier choice would be my grandfather, or yours. For Maggie, with whom the dean falls in love, we can think of no one better than Sasheer Zamata, with her cleverness and her beauty and her angry eyes. For William Beckford, of whose impressive teeth much is made in the novel, we are thinking of Bruce Dern (recently of Nebraska), whose teeth have always impressed us and who happens to play a convincing bad guy. For the part of John Kabaka we will accept no one but Usain Bolt. And now the minor characters: John Morehead Tripoli, a shipwrecked sailor, should be played by the guy from Looking, who it turns out is named Jonathan Groff. We are very taken with this guy from Looking, with his nice little smile and his affable demeanor. The dean’s roommates should be played by Adam Driver, from Girls, and by a seventeen-year-old Peter Lorre. The smaller the part, however, the more famous the actors should be. Characters who appear only briefly should be played by Halle Berry, Anthony Hopkins, Marlon Brando, and Audrey Hepburn. Cary Grant and Ava Gardner should each appear once at the edge of the frame and neither should have any lines. Who should direct such a movie? Ideally we would have many directors and we would pit them against one another. Michael Mann to start, who could give it a smooth stylish look, and Werner Herzog to do the long portentous metaphysically-significant pauses, and maybe also Howard Hawks, for class and quick comedic effects, and Lake Bell, whom we love. It would be good if sometimes there were different sequences playing simultaneously on different screens. It would also be good if we could have some sequences in 3D, but only some, and others in black and white. We want all of this but we’re not willing to sacrifice clarity or narrative thrust. We’re joking but we’re not joking. Learn more about the book and author at Aaron Thier's website. The Page 69 Test: The Ghost Apple. Elizabeth Maxwell's "Happily Ever After"
I see Renée Zellweger in the role of Sadie Fuller. I think this stems from Ms. Zellweger playing Bridget Jones and while writing Happily Ever After, I’d occasionally think of Sadie as the grown up American version of Bridget. And I love the idea of John Cusack in the role of Jason, Sadie’s sort of boyfriend. He does a great job with the bumbling guy who ends up being kind of cool, despite himself. Roger, Sadie’s gay ex husband, would have to be Rob Lowe. As for Aidan Hathway, the hot young character that’s jumped out of Sadie’s latest romance, I’d go for some of the smoldering twenty somethings populating television lately, maybe Jonathan Rhys Meyers or Ian Somerhalder. Visit Elizabeth Maxwell's website, Facebook page, and Twitter perch. The Page 69 Test: Happily Ever After. Sandra Parshall grew up in South Carolina and has worked as a reporter on newspapers in South Carolina, West Virginia, and Baltimore. She lives in Northern Virginia with her husband, a long-time Washington journalist, and three cats. After six novels, my mental images of my protagonists, Rachel Goddard and Tom Bridger, are cemented in place. They’re unique individuals. What actors could possibly step into their roles and become them in a film? This is one of the countless reasons most writers have no say in casting movies made from their books. Readers, who form their own mental images of characters, don’t hesitate to offer suggestions. A surprising number of people have told me they see Rachel as Clare Danes. I’m not sure what accounts for that, but while I admire Ms. Danes enormously as an actress, she wouldn’t be my first choice. If she colored her hair auburn, I would be happy with Rachel McAdams. I see my own Rachel in her smile. But oh, the secondary characters in Poisoned Ground — what a dream cast they inspire. From the moment I conceived the character Jake Hollinger, lumber mill owner and aging Don Juan, I’ve pictured him as Ted Danson, complete with that wonderful thick white hair. For Jake’s love interest, widow-with-a-past Tavia Richardson, Jessica Lange would be perfect. No actor could do a better job than Rob Lowe as Lawrence Archer, the slimy rep for the development company that wants to erect a sprawling resort for the rich in my little Blue Ridge Mountains community. The real fun is in casting the Jones sisters, never married and growing old and increasingly eccentric together in the family home. Meryl Streep would be fabulous as the sharp-tongued oldest sister, Winter, whose mission in life is to keep her sisters in line. Spring, the second sister, makes no concession to age in choosing her flamboyant clothing, hair color and makeup, and Susan Sarandon could capture her perfectly. Summer, the youngest, seems shy and quiet but allows glimpses of a simmering dark streak. I want Mia Farrow in this role. Learn more about the book and author at Sandra Parshall's official website. The Page 69 Test: Poisoned Ground. Annie Dillard said never to trust a novel that wanted to be a movie. “Novels with film contracts in mind have a faint but unmistakable, and ruinous, odor,” she observed in The Writing Life. I wish I’d never read that, not because she isn’t right, but because along with all the scoffing critics that already reside in my head, there is now also Annie Dillard and her Sniff Test. The first time a reader remarked that Above would make a great movie, I bit my bottom lip and tried not to glance Annie Dillard’s way. When others echoed the sentiment, I felt the need to defend myself to her: My intentions were honest. A book, I swear; not a movie! The version of Annie Dillard who sits in the corner of my mind on a straight back chair with her Pulitzer trophy on her lap is not at all pleased with this exercise. I shouldn’t be imagining people from the Silver Screen showing up for their parts, but how easy it is to see Jennifer Lawrence as Blythe Hallowell, the abducted teen who is held deep underground in an abandoned World War II missile silo, and Sam Rockwell as the crazed survivalist who keeps her there. Lawrence has the chops to play a character whose battles are both against external forces (her kidnapper and the beastly dimensions of an almost fathomless bunker) and internal threats such as despair. She’d be at her fiercest when raising a child in captivity. Also, she’ll age well. Having delivered a magnificent performance as an astronaut isolated for years in a lunar mining base in Moon, Rockwell would excel as the end-of-the-world prepper, Dobbs Hordin. Forest Whitaker would be a perfect counterbalance as the failed father looking for an opportunity to redeem himself. None of these actors came to mind while I was working on the novel, but I’ll confess that when I wrote the book’s final scene, I did hear a song. Sorry, Annie, but it’s the kind of song they play when the credits start to roll. Each time I listen to Glory Bound by The Wailin’ Jennys, I am back to the rush of that moment – when there is no page, no screen either. There is only everything falling into place. There are a hundred smells that accompany such a thing, none of them ruinous. Learn more about the book and author at Isla Morley's website. The Page 69 Test: Above. His novels include Covenant, Immortal, and Apocalypse. Apocalypse is a very fast-moving story, and as a thriller I think would make a fabulous film. Some of the scenes, especially those involving the virtual-replay of real-world events in a secret government facility and the captive black hole chamber would make marvellous visual entertainment. As ever, I’d love to see Hugh Jackman take on the role of Ethan Warner, with perhaps Michelle Rodriguez as Nicola Lopez. Both actors do a great job of playing believable rough-and-tumble action heroes. Wayne Gladstone's "Notes from the Internet Apocalypse"
Wayne Gladstone is a longtime columnist for Cracked.com. He is the creator and star of the Hate by Numbers online video series. His writing has appeared on McSweeney's Internet Tendency, Comedy Central’s Indecision, and in the collections You Might Be A Zombie and Other Bad News and The McSweeney's Joke Book of Book Jokes. Notes from the Internet Apocalypse is the first book in the Internet Apocalypse trilogy that tells the story of one man's search for the Internet when the whole world has gone offline. Along the way, he is joined by a gossip blogger named Tobey and an Australian webcam girl named Oz. Gladstone is a sarcastic, emotionally scarred New Yorker. It has to be someone who can show a lot of pain without being overt about it. And it has to be someone who can be manically comedic. Joaquin Phoenix, James Franco, and Charlie Day all come to mind. For Oz, the 20-something Australian webcam girl, the only answer is Emily Browning. It's hard to think of an actress more perfect, especially considering she's Australian. For Tobey, I have a hard time. If i had a time machine I'd take young Owen Wilson, but I'm having a hard time figuring out who that is now. Perhaps Jonah Hill. Jeeves, the gay, prog rock-loving, psychic, former librarian was made for Patton Oswalt. He could do so much with that role, especially as the trilogy progresses. Rowsdower, the Government agent who is tasked with enforcing the draconian NET Recovery Act could be played by Willem Dafoe or Steve Buscemi. Then there's robber baron billionaire, Hamilton Burke. Could very easily go Kevin Spacey on that one, but I'd like to go outside the box for Robert Redford. Lastly, there is Pennsylvania's junior senator, Bible-thumping Melissa Bramson. I could see Kirsten Wiig, Tina Fey or Julianne Moore having a lot of fun with that character. Visit the Notes from the Internet Apocalypse website. Wendy Ruderman & Barbara Laker's "Busted"
In my dreams, a Hollywood producer makes a movie out of Busted: A Tale of Corruption and Betrayal in the City of Brotherly Love, the book I co-authored with Philadelphia Daily News colleague Barbara Laker. In my nightmares, the director picks Zelda Rubinstein, the 4'3'' actress from the 1982 film Poltergeist, to play me in the movie ("Go into the light, Carol Ann!"). Then I wake up and realize: a) Zelda Rubinstein is way too old to play me and b) the 76-year-old actress died in 2010. A gal can dream, however, and Barbara and I, along with our friends and family and what seems like the entire Daily News staff, spend time fantasizing about one day seeing Busted on the big screen, or even a little one as a television crime drama. And why not? Although Busted is nonfiction, those who've read the book say they can visualize a movie or HBO series about two dogged journalists, both suburban moms, who find themselves plunged into a world of unsavory drug informants, violent drug dealers, thieving narcotics officers, pimps and prostitutes - all set against the backdrop of a flailing and bankrupt city newspaper. As author and columnist Lisa Scottoline put it, Busted reads like a turbocharged thriller, all the more compelling because it's true." And Edna Buchanan, a journalistic legend, said in a message that she left on my home answering machine, "It reads wonderfully and it will probably make a wonderful movie." So, we dream. In our book, written together, literally side-by-side, but in my voice, Barbara is described as "oblivious to her ability to make men's heads turn." She has "long, wavy highlighted blond hair and a tangerine slice of a nose. Her big green eyes, flecked with caramel, reminded me of top-of-the-line granite kitchen counters." (We had some small spats over how to describe Barbara because she does not see herself as beautiful). But, here are the names of actresses who friends and colleagues think of when casting Barbara's character: Charlize Theron, Julia Roberts, Sandra Bullock, Cate Blanchett, Diane Lane and Maria Bello. And who do I get? Zelda Rubinstein, when my colleagues (ok, just one snarky colleague) are in the mood to rib me. The more charitable responses for who should play me in Busted are: Tina Fey, Ellen Page and Shari Albert, a Philly born and raised actress who wowed audiences in The Brothers McMullen, which won the Sundance Film Festival's Grand Jury Prize in 1995. In the movie, Albert plays the Jewish girlfriend of one of the brothers. I do kind of look like her, only with a big nose. I'm 4'11'' with a cheap, page-boy haircut. Learn more about Busted at the official website. The Page 99 Test: Busted. Bruce DeSilva grew up in a tiny Massachusetts mill town where the mill closed when he was ten. He had an austere childhood bereft of iPods, X-Boxes, and all the other cool stuff that hadn’t been invented yet. In this parochial little town, metaphors and alliteration were also in short supply. Nevertheless, his crime fiction has won the Edgar and Macavity Awards; has been listed as a finalist for the Shamus, Anthony, and Barry Awards; and has been published in ten foreign languages. His short stories have appeared in Akashic Press's award-winning noir anthologies. He has reviewed books for the New York Times Sunday Book Review and Publishers Weekly, and his reviews for The Associated Press have appeared in hundreds of other publications. Previously, he was a journalist for forty years, most recently as writing coach world-wide for The Associated Press, editing stories that won nearly every major journalism prize including the Pulitzer. He and his wife, the poet Patricia Smith, live in New Jersey with two enormous dogs named Brady and Rondo. I think my first two novels, Rogue Island and Cliff Walk, would work best as the inspiration for a television series. Most Hollywood crime movies are filled with car chases, prolonged gun-battles, and explosions; and those two books are bereft of them. But the best TV crime dramas—shows like HBO’s True Detective and FX’s Justified—place a premium on character development and sense of place. 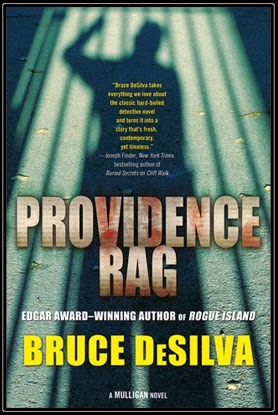 However, my third novel, Providence Rag, with its menacing villain, chilling murder scenes, and violent mass protests, is made to order for the movies. Back when I began work on my first novel, Dennis Lehane, one of our finest crime novelists, advised me against envisioning any actor in the lead role. If you do, he said, it will unduly influence your character development—and not for the better. So I resisted. But when I finished that book, I couldn’t help but picture Dennis Leary, the Boston-born the actor/director who created Rescue Me for the FX television network, playing Mulligan. Leary has the perfect build and embodies my protagonist’s wise-guy attitude and dislike of authority. He’s a dozen years older than Mulligan, but I think he can play younger. And with his native Boston accent, he’s a good bet to master the Rhode Island accent, a quirky blend of Boston and Long Island. Liev Schreiber, the San Francisco-born actor whose varied career has seen him play the lead in Hamlet to rave reviews and star in the movie Defiance alongside Daniel Craig, is the right age and also has that look. And his mastery of the working class Boston accent in his current role on Showtime’s Ray Donovan offers hope that he could learn to talk like a Providence native, too. On the other hand, the movie would make more money if Brad Pitt or Matt Damon, another Boston native, could be sweet-talked into it. The noir mood Clint Eastwood gave his best film, The Unforgiven, is what I envision for Providence Rag; so, Clint, I’m waiting for your call. Cara Black's "Murder in Pigalle"
Cara Black is the New York Times and USA Today bestselling author of 14 books in the Private Investigator Aimée Leduc series, which is set in Paris. Murder in Pigalle is the latest installment. 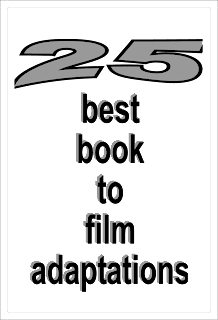 Black has received multiple nominations for the Anthony and Macavity Awards, a Washington Post Book World Book of the Year citation, the Médaille de la Ville de Paris—the Paris City Medal, which is awarded in recognition of contribution to international culture—and invitations to be the Guest of Honor at conferences such as the Paris Polar Crime Festival and Left Coast Crime. With more than 400,000 books in print, the Aimée Leduc series has been translated into German, Norwegian, Japanese, French, Spanish, Italian, and Hebrew. Hmmm... great question. I always picture the actor Philippe Noiret, who’s sadly passed away, as Commisaire Morbier - Aimée Leduc’s godfather. His basset hound eyes, grease stain on his tie, slipping some Franc notes to his informers, an old school ‘flic’ that Noiret, an actor played in a classic buddy cop film Ripoux. Noiret played many varied roles but I always see him in this one when I write his character. To get Morbier and Aimée in scene I sit them in a cafe, bistro and voilà they just start talking. You know food and the French. I will resurrect Robert Altman to direct my movie because his films gave viewers exactly the sensation that historians get working with documents. You hear snatches of conversation that you don't quite understand, and only with time in patience can you fit (some of) the parts together. That is especially true if your subjects, like mine, are spies, informers, and political spin-meisters. A Plague of Informers is a set of linked stories rather than a grand narrative, and like many Altman films it could have a cast of hundreds. The episode I'll cast here concerns Matthew Smith, who joined a Jacobite conspiracy in 1696 to overthrow the English government (Jacobites were rebels who wanted to put King James II, who had been deposed in 1688, back on the throne of England). Then Smith changed sides and tried to reveal the conspiracy to the Duke of Shrewsbury, the "secretary of state" responsible for national security. Of course Smith asked Shrewsbury for money so that he could keep pretending to be a conspirator -- he needed to buy a horse, armor, and drinks for his Jacobite companions, he said, so that the conspirators would trust him and spill their secrets. Shrewsbury, deciding that Smith was a fraud, refused to pay him. Unfortunately for Shrewsbury, it turned out that there really was a plot against the government. Now Smith could accuse Shrewsbury of willfully ignoring him to cover up the plot and indeed of being a Jacobite plotter himself. The job of defending Shrewsbury fell to James Vernon, Shrewsbury's immediate subordinate. Deploying bribery, subterfuge, and the services of the unsavory spy and propaganda-writer named Richard Kingston, Vernon struggled valiantly to discredit and silence Matthew Smith. To know if he succeeded you will have to see the movie (or read my book!). Jim Carrey would get the manic side of Matthew Smith, a swash-buckling enthusiast who probably believes his own fantasies. Richard Kingston is also a spinner of fantasies, but is harder to love or laugh at; his lifetime experience dealing with lies and liars has left an almost palpable oily sheen. You would not have bought a used car from this man. I would not have bought a used car from William Macy in Fargo, so I'll cast him as Kingston. James Vernon has layers of complexity. He is openly disgusted not just with Smith but with his (temporary) ally Kingston, whom he employs to write propaganda against Smith even though he thinks Kingston is a creep. But perhaps he also resents working so hard to protect his boss Shrewsbury, who has has thrown up his hands in dismay and retired to the country. I want someone a little older, a little run down, who conveys intelligence and repressed anger. Tom Wilkinson? As for Shrewsbury, he reminds me of Jude Law's character in The Talented Mr. Ripley -- great-looking nice guy, unaware of how much resentment his privilege could provoke. Where are the women? There is one bit part for a female actor that really encapsulates the criss-crossing resentments infusing this story. Shrewsbury's colleague in office, William Trumbull, disliked Shrewsbury and Vernon so much that he was ready to believe Matthew Smith. The wives got into it too. In 1695 James Vernon's wife Mary, learning that Trumbull's wife Catherine had felt slighted by her, wrote to Catherine to apologize. Catherine replied that Mary need not have taken the trouble to write, as “you have so much better acquaintance that you can never miss that of myself.” Judi Dench could say that line really well. The Page 99 Test: A Plague of Informers. Megan Hustad's "More Than Conquerors"
Megan Hustad has written articles, essays, and commentary for the New York Times, New York Post, Salon, Slate, The Big Money, The Daily Beast, The Awl, and American Public Media’s Marketplace, and is the author of How to Be Useful. She has lived in Minneapolis, London, the Caribbean, and Amsterdam, and currently lives and works in New York City. I am tempted to joke that Keira Knightley should play everyone—my sister, my mother, me, my father, grandmother, great grandmother, etc. All non-family members, male and female, would be played by either Peter Sarsgaard or Bobby Cannavale and we'd arrive at some Charlie Kaufman-esque caper. Sandy Duncan for my mother. There's the sweet smile. The bob. Duncan has the same perkiness, somewhat undercut by wistfulness, that my mother has. They came of age in the 1950s and something of that era still animates their expressions. I'm thinking of Duncan circa this episode of The Muppet Show. All this said, my mother's a brunette but doesn't sound like one. In the book I mention that my father was said to look like Marlon Brando when he was younger. But I'd give the role to Mark Ruffalo, who not only has the right look but consistently plays roiling emotions—whether born of confusion or conviction—in a way that reminds me of my father. Dana Stevens of Slate wrote of The Kids Are All Right that "Ruffalo just Ruffaloes it up" in the film. Elsewhere Roger Ebert remarked on "his gentle response to other actors." That captures something of my father, too. Ruffalo could definitely Ruffalo it up in the More Than Conquerors movie. My sister. Sarah Polley. A taller Naomi Watts with hair straight and short. Anyone who plays fierce pride warring with intense vulnerability well. Me. Emily Blunt crossed with Allison Williams? I have no idea. I like Blunt's near-perpetual look of cautious defiance. It appears she can't help it, as if her skepticism is congenital somehow. There's a slight chance I'm suggesting Allison Williams only because I associate her face with Greenpoint, Brooklyn apartments like the one I had in 2001. My grandfather Orville. It's a small role. Herewith we start raising the dead. Paul Newman. My grandmother Marian. Julie Christie lacks Marian's round cheeks but otherwise, I can see it. The resemblance lies more in her presence, even while puttering around in house dresses, chattering mindlessly. My grandmother Vivian. Vivian Vance. Many smaller roles I won't belabor here. Viggo Mortensen would look good striding across the Boone Biblical College campus in a long black coat. Carey Mulligan plus twenty pounds would make a heart-rending young Clara. Lucinda = Gennifer Godwin, by a mile. Stephen Dillane would get one sleepy scene in a posh hotel room. J.T. Ellison's "When Shadows Fall"
J.T. Ellison is the New York Times bestselling author of eleven critically acclaimed novels, including The Final Cut with Catherine Coulter, When Shadows Fall, Edge of Black and A Deeper Darkness. Her work has been published in over twenty countries. Her novel The Cold Room won the ITW Thriller Award for Best Paperback Original and Where All The Dead Lie was a RITA® Nominee for Best Romantic Suspense. She lives in Nashville with her husband. It’s strange how characters change, come to life, become real people in the writer’s mind as the books take shape. Dr. Samantha Owens is evolving for me. She’s come out of her grief, is looking forward, and that’s changed her whole outlook, and as such, her personality. I always saw her as a young Natalie Portman, with that presence, that intense gaze, but I’ve come across a new to me actress who would be a great for the role. Her name is Phoebe Tonkin. She looks more like Sam to me now, she’s no less intense, but she’s got a delicacy to her that embodies the vulnerability and strength of the new Sam Owens. Xander Whitfield was always Josh Hartnett to me, but he too has grown and become his own person. He’s lighter as well now that he has Sam, happier, more content; they’ve healed each other’s wounds. Get that kid to smile, and there’s a keen resemblance between them. Fletcher has always been Robert Downey Jr., for a variety of reasons – attitude, irreverence, and just plain hotness. Channing Tatum would make a good Adrian – he can do that thousand- yard stare, and Jessica Lange would be perfect as Curtis Lott. So let’s go make this happen, shall we? The Page 69 Test: Edge of Black. The Page 69 Test: When Shadows Fall. Doug Most's "The Race Underground"
Doug Most is the deputy managing editor for features at The Boston Globe. He is the author of Always in Our Hearts: The Story of Amy Grossberg, Brian Peterson, the Pregnancy They Hid and the Child They Killed (St. Martin's True Crime, 2005). He has written for Sports Illustrated, Runner's World and Parents and his stories have appeared in Best American Crime Writing and Best American Sports Writing. I have thought about the cinematic aspects of this book, because the story has a number of riveting, dramatic scenes and storylines. And certain characters it's quite easy to imagine them being played on screen. The most obvious is Alfred Ely Beach. He was a skinny, opera-loving inventor, who was in perpetual motion and loved to work with his hands. His stand-off with the 300-pound crime boss, Boss Tweed, is an incredible David-and-Goliath tale. For Beach I could envision Steve Buscemi, who is sort of this wired character, skinny and could really capture the quirks of Beach. For the nemesis, Tweed, that would have been a great role for James Gandolfini, sadly. Instead, John Goodman could be great, his voice booming as the corrupt state senator. Two other key characters are the Whitney brothers, Henry and William. For Henry Melville Whitney, the older brother, who was short and stocky and had a thick mustache, it feels like a role for Matt Damon to inhabit. Naturally, as a Bostonian, he seems like a logical person who should be involved! And as it so happens, William Whitney was the skinnier, taller, more athletic looking brother, and so naturally that has to be Ben Affleck. As for William Whitney's wife, Flora, the handsome woman who loved to entertain, Frances McDormand is a good fit. Two of the most important roles are William Barclay Parsons, the famous New York engineer who designed the subway, and William Steinway, the brilliant piano manufacturer and businessman who played a critical part in bringing the subway to reality. Parsons was tall, Lincolnesque in stature, with deep set eyes. Daniel Day Lewis is too obvious, however, so instead I could imagine Hugh Jackman really bringing Parsons to life. And Steinway, a husky man with a deep dark beard, would be played by another Les Miserables cast member, Russell Crowe. The brilliant engineer Frank Sprague needs an older actor to inhabit him. Harrison Ford, who looked so great with glasses as Branch Rickey, would fill Sprague's role. Learn more about the book and author at Doug Most's website, Facebook page, and Twitter perch.